This list is items needed to create NICU care packages for Texas Children's Hospital in Houston, Texas. They will be delivered on Judah's second birthday, August 22. If you would like to contribute, please order your gift by August 12. 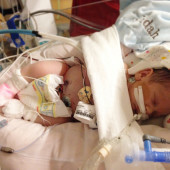 Last year we were able to provide 58 care packages which almost covered the whole NICU. This year's goal is to provide 70 care packages.